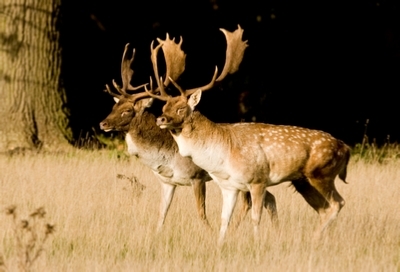 The deer rut which takes place in October / November has to be one o the must see events in the wildlife calendar. Most of the deer in Holkham Park are fallow deer, there is a small herd of red deer but as the number one red stag has very little competition there is not normally much activity among the reds. There is a herd of several hundred fallow deer with numerous competing bucks so these are the ones to watch if you want to see the rut in full swing. During the rutting season the male deer (red stags, fallow bucks) will patrol a group of females (red hinds, fallow does) regularly checking for any that are in season. When rival males meet they will walk side by side (parallel walking) to gauge which is the stronger of the two. The weakest will usually back down but if they are evenly matched one will suddenly turn to face the other, they will lock antlers and push each other to determine who is the strongest. The winner will get to mate with the females. 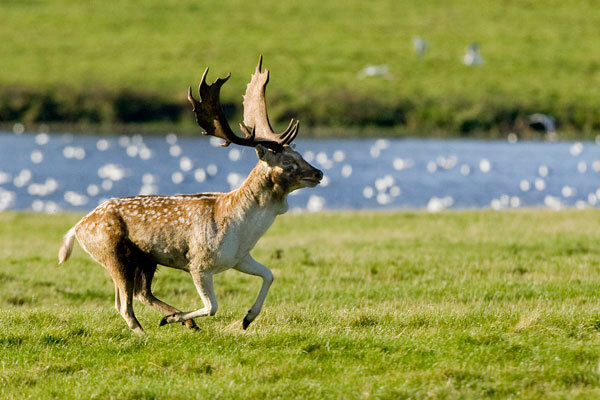 A fallow deer buck roars to proclaim ownership of a group of does.